Syrian migrants crossing from Turkey arrive at Lesbos, Greece, Sept. 7, 2015. 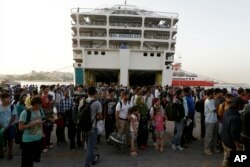 The island of some 100,000 residents has been transformed by the sudden arrival of some 20,000 refugees and migrants. The head of the International Rescue Committee is pressuring the United States to do more to ease the plight of Syrians refugees fleeing conflict and streaming into the European Union, whose overall response he criticized as "fumbling, feeble." IRC chief David Miliband said that, with countries such as Turkey, Jordan and Lebanon staggering under the burden of 4.5 million Syrian refugees, the United States needs to step up its role in refugee resettlement. "Over the four years of the war, the U.S. has only taken 1,400 Syrian refugees in total," Miliband said on NBC’s Meet the Press Sunday. "To maintain its leadership position in refugee resettlement," it should take 65,000 of the 130,000 Syrians that the United Nations recommends should be resettled around the world by 2016’s end. 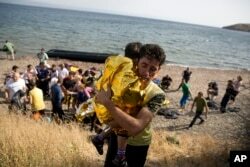 A Syrian man carries a child wrapped in a thermal blanket as they arrive with others at the coast on a dinghy after crossing from Turkey, at the island of Lesbos, Greece, Sept. 7, 2015. In a weekend interview with Reuters, U.S. State Department spokesman John Kirby indicated the United States could take in another 1,500 Syrians this year and even more next year. Germany appears to be taking on that leadership role, Miliband said, anticipating it will take in some 800,000 refugees this year alone. But he said most European Union countries and the international community as a whole have responded inadequately to the migrant crisis, stemming from the four-year conflict in Syria under President Bashar al-Assad’s brutal regime. Miliband also called on wealthy Gulf states to do their part in caring for hundreds of thousands of refugees. Miliband said while the migrant crisis’ most recent choke point has been Hungary, which had detained but this weekend finally released thousands of desperate refugees trying to reach Austria and Germany, "the eye of the storm has been Greece." He said he'd spoken Sunday morning with the IRC's field director on Lesbos, "the key island where people are transiting from Turkey to get into the European Union, and frankly you’ve got 25,000 people … stuck" there. Refugees and migrants wait for a bus, transporting them to the metro station, after their arrival from the northeastern Greek island of Lesbos to the Athens' port of Piraeus, Sept. 7, 2015. He said 3,000 to 4,000 are arriving daily, "and the immediate crisis is to provide water, sanitation and transportation" off Lesbos and three neighboring islands. Another call for resettlement assistance came from Michael Ignatieff, a former Canadian Party Liberal Leader. In an opinion piece published in The New York Times on Sunday, he wrote that the United States, Canada, Australia, Brazil and other countries should send teams to Europe to register and process refugees for admission under a quota system. Citing past efforts to care for Hungarians in the 1950s and Vietnamese in the 1970s, Ignatieff called the crisis one of biblical proportions that demands a global response. Last week, White House spokesman Josh Earnest said the United States since 2011 has provided more than $4 billion in humanitarian aid to those affected by the Syrian conflict. "That’s a substantial commitment and certainly more than any other country" has made, he said. The aid has been channeled through the Office of the U.N. High Commissioner for Refugees. 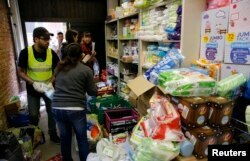 Volunteers from Syria prepare the distribution of hygiene products to migrants at a former police compound outside the Berlin Office of Health and Social Affairs (LaGeSo) in Berlin, Germany, Sept. 7, 2015. Earnest says immigration has become a difficult policy problem for the United States, because so many people – including families with children – have entered illegally. An estimated 11 million currently live in the country without authorization. Jonathan Adelman, an international studies professor at the University of Denver in Colorado, said the United States has "very strict laws because we have our own issues." But he said the image of the dead Syrian toddler who’d washed up on a Turkish beach last week could reignite a U.S. debate about doing more to ease the migrant crisis. "Maybe we’ll begin to see some change in American perception," Adelman said. "But, right now, it just hasn’t been sufficient enough for the [Obama] administration or Congress" to get really involved.